Hiding desktop background can be useful in many situations. For example, if you have assigned any personal photo as your desktop background, then you can easily hide it during a screen sharing session or when you are at a pubic place. You can toggle the visibility of wallpaper with the predefined hotkeys. Previously, we have covered some articles like hiding system desktop icons, Taskbar, system clock, etc. But hiding the desktop background is what really different. So, let’s see how to hide desktop wallpaper temporarily in Windows. How to Hide Desktop Wallpaper Temporarily in Windows? Desktop Manager is a free software to hide desktop wallpaper temporarily. It adds a system tray icon, that you can use to hide desktop wallpaper. Alternatively, it also assigns some keyboard shortcuts to do the same. It is a very lightweight software that you can easily install on your PC and use it. Also, it doesn’t consume lots of system resources and hence, system performance is not affected. Step 1: Grab the setup file of Desktop Manager from this link and then install it. After that, run it and you will see its icon in the system tray of Windows. Step 2: Now, to hide the desktop wallpaper, you can click on its tray icon and then un-check the Show Wallpaper option. Alternatively, you can also press the ” Ctrl+ win+] ” keyboard shortcut to hide the desktop wallpaper. You can again check the option or hit the hotkey again to bring back the desktop wallpaper. So, in this way, you can hide desktop wallpaper temporarily. And Desktop Manager freeware is all you need to make it pretty simple to do that. All you have to do press certain keys to use this software. It is portable software, so if you want to keep the changes that you have made, then you can make it run at Windows startup. Use the right-click menu of the tray icon and select “Auto start with Windows” option. In the above tutorial, I have sketched some very easy steps to demonstrate how to hide desktop wallpaper temporarily. And Desktop Manager freeware makes it pretty easy to do that. I really like the fact that you can easily hide the desktop wallpaper via a hotkey. And bring it back in the same way. 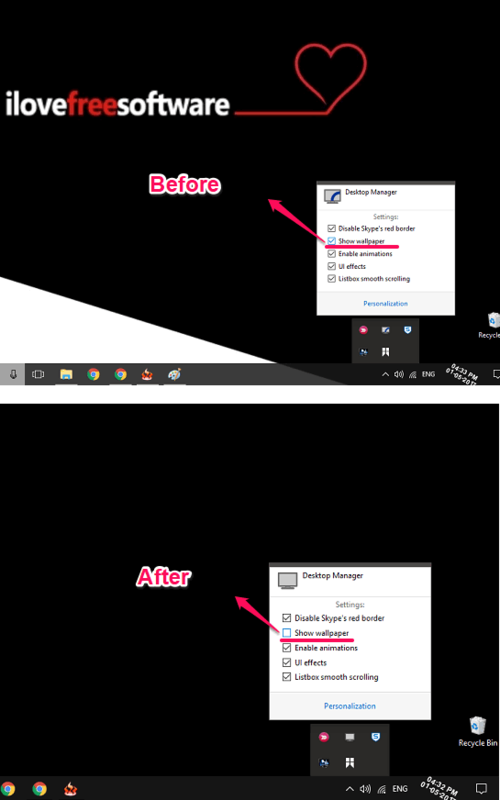 So, if you are looking for solutions to hide desktop wallpaper temporarily, then this tutorial will show you how.